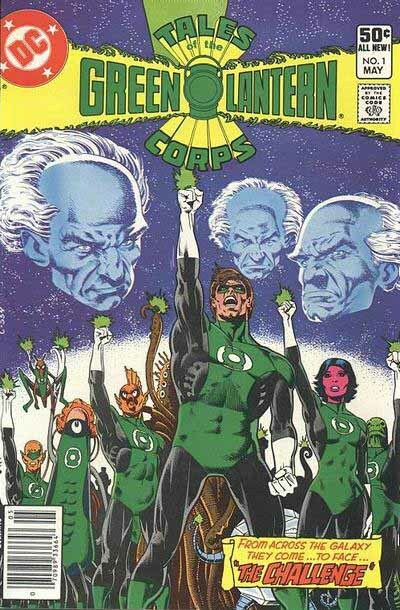 As the storylines of the silver age Green Lantern developed, his “parent” organization, the Green Lantern Corps was gradually revealed and explored by various writers, and fans seemed to love the idea of a huge number of fellow Green Lanterns in every possible shape, substance and size. I know I did. 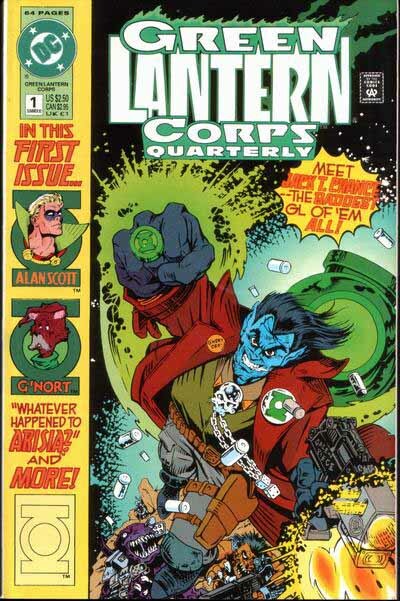 This interest begat the first Green Lantern spinoff, a three-issue miniseries in 1981 involving the entire Corps and their creators, The Guardians of the Universe, first issue seen above. The logo was the familiar Saladino one with additions above and below. I don’t know for sure who did them, but it was probably Gaspar Saladino on those also. Not a great design, as it creates a lot of dead space around the logo, though the concept is okay, with the additions acting as if radiating out of the lantern. I would have brought the additions in a lot closer to the rest. In any case, the three miniseries covers featured the first U.S. art by Brian Bolland, and it’s impossible for any logo to hamper his talent. Over in the monthly title, appearances by the Corps had also been growing steadily, first in a series of backup stories (some written by me, I add modestly), then in the main storyline. 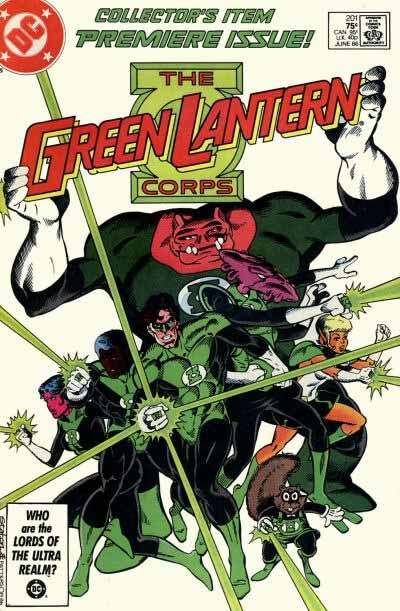 Writer Steve Englehart in particular liked the idea of using more of the Corps regularly, and in 1986, with issue 201, the Corps officially took over the book with this new logo designed by Alex Jay. In late October 1985 I got a call from Richard Bruning who asked to see my portfolio. At my appointment he offered the Green Lantern Corps logo to me. Richard showed some concepts with the words stacked in several arrangements and the lantern incorporated in various ways. He wanted to incorporate a large lantern in the logo and left it up to me to come up with something. Back at my studio, I reviewed the designs and sketched out a design with “Green Lantern” on one line. I saw the possibility of positioning the “L” in the center of the lantern’s lamp and balancing the length of the logo from the “L”. Most of the letters in the sketch had thick and thin strokes. The “R” had some problems that needed to be worked out. The letters’ rounded corners was a way to update the logo and set it apart from the earlier logos. The tight pencil rendering was very close to the finished logo. Only the “G” and “L” had the thick and thin strokes; a crossbar was added to the “G”. The bottom stroke of the “L” was shortened in the finished logo; it aligned with the inside of the vertical stroke of the “A”. Being able to see that small segment of the circle between the “L” and “A” improved that part of the logo. Richard didn’t like how the top of the circle and “L” came together. So the “L” was extended a little above the circle. The leg of the “R” in Corps was adjusted in the finished logo. In the middle of November I delivered my first DC-commissioned logo to Richard. Well done, Alex, and from that a career as a logo designer for DC began! I think this works well, though like the mini-series logo it does create some dead space to each side of the lantern at the top. I find the letter forms and layout attractive, even so. 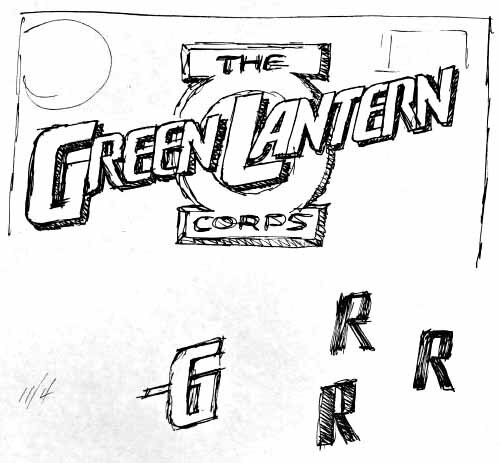 Note that this is the first time the lantern in the logo takes on the same stylized look as on the Green Lantern uniform, rather than the more realistic lantern shapes of past logos. That helped to update the look, and comes from Bruning’s fine concept sketches. This version of the title ran out of steam in 1988, and for a brief time there was no monthly GL title, until it was relaunched in 1990. 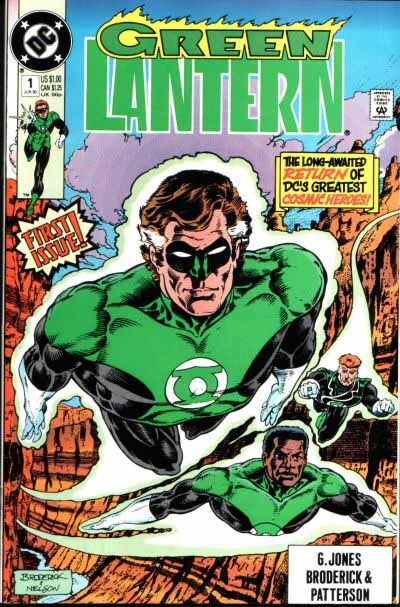 In that time, a miniseries filled in some gaps in Hal Jordan’s history, and added some new ideas. The top line of this logo is the old Silver Age one created by Ira Schnapp, but the rest is new, and I find it very attractive. The word DAWN is very blocky, bold, and strong, and I like the way the center of the D and A end below EMERALD, and the way the W and N are connected. EMERALD, in contrast, is thin, elegant, and full of ovals, with a small drop-shadow to give it weight. This is a great example of balance and contrast between the two words, both of which are important. The logo was designed by Keith “Kez” Wilson, who had been a staff cover designer for several years, and was now taking freelance logo work. Thanks to Steven Bové for letting me know he did this and the next logo. 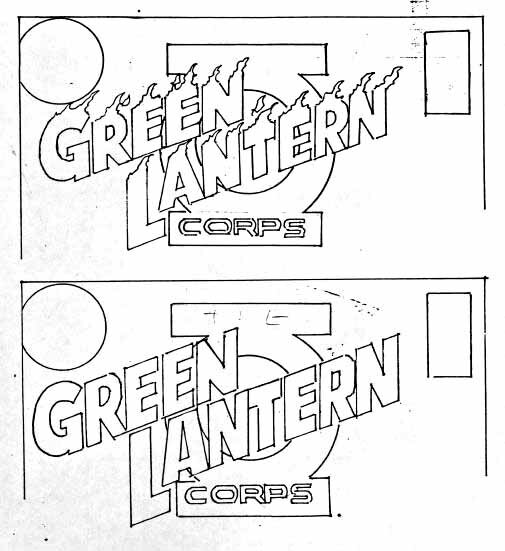 It merely added CORPS QUARTERLY to the existing logo, and covered up a little more of the word LANTERN, probably also by Kez Wilson. For such a long title, it’s still quite readable and compact, though, with enough variety in sizes and shapes to give it an attractive look. Notice how the C is almost a mirror reflection of the G. Despite the length, I actually like this version better, it’s more balanced. A few more spinoffs next time, then we bring Green Lantern into the 21st century. This entry was posted in Logo Studies on November 16, 2007 by Todd. Both logos were designed by Keith Wilson. I notice that up to here the lantern logo keeps straight up-and-down lines on the crossbars. At some point they gave the crossbars angled ends, a change which I actually like very much. I hope you point out where that happened, I’m curious to know whose idea it was. I think you’re referring to the next version of the logo on the monthly book, David. I’ll be covering that next time. Hi, Todd! Been a while, eh? Mr. Bove gave me the heads up about your web site and blog (which is a great blog, BTW). And yes, I remember working on the 90s logos. 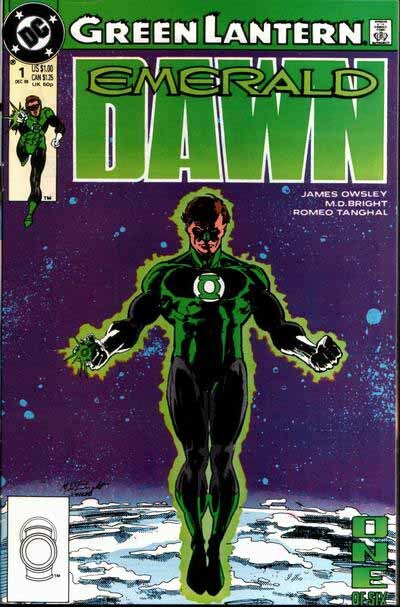 I agree that the Lantern logo did not work as well as the EMERALD DAWN (“Lantern” had too many darn letters in it to make as strong a statement as “Dawn”). After the success of the “DAWN” mini-series they wanted to carry the theme into the new Green Lantern series logo, so I shoehorned it in. 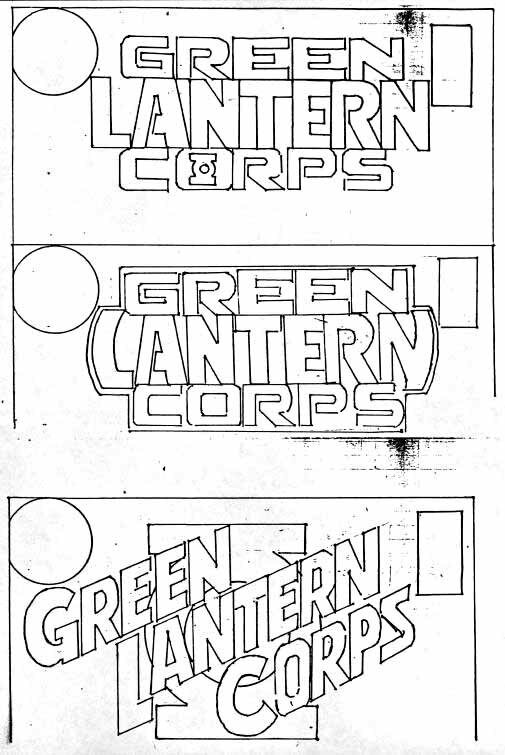 And the add-on elements for the “Corps Quarterly” logo were more than likely done by someone in the cover department. Hey, Keith, great to hear from you! Thanks for the info, and you should check out my Batman logo study as well, where your name also came up. Hope you’ll keep in touch.